"Do you sincerely believe that if your husband were to kiss you, you would change into a cat and rend him to bits?" The first horror film that Val Lewton produced for RKO in an effort to save the studio from ruin was the classic Cat People, which stands as a model for a subtle kind of implied and psychological horror. Part of this may have been from the fact the films were shot on the cheap, and so effects were not at all in the budget, but whatever the reason, Lewton uses implied threats that are never seen clearly onscreen to trigger shivers through the use of the viewer's imagination rather than the usually disappointing direct depiction of horrors. Ship designer Oliver Reed (Kent Smith) meets mysterious artist Irena Dubrovna (Simone Simon), who seems to have a strange fascination for the black panther kept in the local zoo. She eventually confides in him that in her native Serbia there were degenerate devil-worshippers who were able to assume the shape of large cats, and she fears that she bears the taint of their blood. Ollie scoffs at the notion and they soon marry. But Irena's obsessions get in the way of their relationship: she refuses to consummate their relationship, lest she lose control of her emotions and become a vicious cat. Oliver puts up with that for a while, but when the help of psychiatrist Dr. Louis Judd (Tom Conway) doesn't seem to help, eventually he starts to succumb to the charms of coworker Alice Moore (Jane Randolph). But someone or something begins to stalk Alice and others who have run afoul of Irena. Several set-pieces provide most of the horror, a stalking of Alice in Central Park and an unforgettable attack on her in a deserted swimming pool. Only vaguely panther-shaped shadows are ever seen, though catlike cries echo over the soundtrack. It's masterful work, and director Jacques Tourneur has the same sharp visual sense that his father Maurice possessed. Nearly every scene is nicely staged and carries a feeling of a painting in greys. The film takes a page from Henry James' The Turn of the Screw, in that we're never entirely sure as to whether Irena is in fact a cat person, or if she is just completely nuts. But either way, she's quite dangerous. Simone Simon is memorable as the lead, with a kittenish face and manner that makes her quite credible as a cat person. Kent Smith is kind of colorless, but that's appropriate to play off Simon and her eccentricities. They do nice work in bringing to life an adventure in Jungian psychology, with echoes of ancestral race memories and archetypal personalities. RKO liked to provide Lewton with lurid titles and to have him come up with movies to fit them. One of the strangest combinations is 1944's sequel, The Curse of the Cat People, which sounds like a straight horror but is instead a psychological essay on childhood, with only a few moments of suspense, and one of those is a dream sequence. Oliver and Alice (Smith and Randolph again) have now married, and the story picks up some years later, with their child Amy (Ann Carter) a strange and lonely girl just turned six. Disliked by the other girls of Tarrytown, she retreats into a fantasy life and develops an imaginary friend who is none other than Irena. But Irena seems oddly substantial for an imaginary friend, casting shadows and accepting gifts. Oliver and Alice are concerned about Amy's conduct, both with her imaginary friend and her affection for mad old actress Julia Farren (Julia Dean), whose daughter Barbara (Elizabeth Russell) bears an enmity for Amy. The film really isn't a horror at all, despite its title, though RKO insisted that at least one shot of a cat be included early on. The spooky Farren house also sports a stuffed cat with a bird in its mouth; the drawing room is a veritable taxidermy museum that suggests a model for the Bates house in Psycho. The scenes with Irena have a fairy tale fantasy quality (not least of which is the princess-like gown she wears). Jung is back in full force, with his theories on childhood given center stage. There's an interesting complementary nature between Amy and Mrs. Farren: the girl develops an imaginary friend to console herself in her loneliness, while Mrs. Farren is unable to see that she has a daughter and ignores Barbara, inspiring hatred and one of the few threatening scenes in the picture. That threat is underlined if one recognizes Elizabeth Russell as the cat woman who interrupts Irena's wedding dinner with a sinister greeting; is she also a cat person in this sequel? It's not clear, in best Lewton fashion. The sequel tends to be rather literary, with elements of A Christmas Carol, The Legend of Sleepy Hollow and references to Robert Louis Stevenson. Even though there's little horror onscreen, it's a worthwhile picture with some stunning visuals, thanks to Gunter V. Fritsch and Robert Wise, who replaced Fritsch after he fell far behind in shooting. Regardless of whose work is which, there are some lovely visuals that underline the very personal and affecting thematic materials. Image Transfer Review: The original full-frame picture generally looks quite satisfactory. Greyscales are nice and broad, and black levels are good. The picture is occasionally very grainy, which tends to be rendered in slightly sparkly manner. A few speckles and blotches are visible, but the films look quite nice overall. Audio Transfer Review: The 1.0 mono is a rich mix that gives a creepy vibe to the first film. There is significant hiss on it, however, which is rather cleaner on the sequel. Dialogue is clear enough, and music is reasonably good sounding, though it has the expected tinny and thin quality for a 1940s picture. Extras Review: The principal extras are commentaries on both films by Greg Mank. On Cat People he tends to narrate in too many places, interspersed with the interesting analysis and background information. The sequel's commentary fares much better, and is almost entirely devoted to substance. It's unfortunate that Warner didn't have the foresight to have Simon or Wise (both of whom only just died earlier in 2005) record a commentary, but Mank at least has telephone interview recordings with Simon that cover a few points of interest, including her complete disdain for the sequel. The only other extras are a pair of rerelease trailers, one for each film. 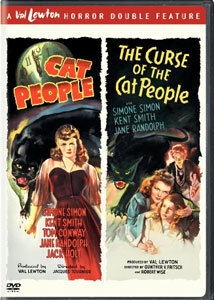 Two unforgettable psychological horror classics from Val Lewton, spruced up with highly informative commentaries.